The definitive edition of HPB's writings in 15 volumes. Volume 6 is from 1883, 1884 and 1885, and includes articles such as: 'Tibetan Teachings on the dissociation of the Human Constitution after Death'; 'True Nature of Mediumship and its Relation to Chelaship'; 'A Bewitched Life', one of H.P.B. 's Occult Stories. Helena Petrovna Blavatsky was born on August 12, 1831, at Dnepropetrovsk (Ekaterinoslav), Ukraine, daughter of Colonel Peter Alexeyevich von Hahn and novelist Helena Andreyevna (n�e de Fadeyev). In 1849 she married N. V. Blavatsky, and shortly thereafter began more than 20 years of extensive travel, which brought her into contact with mystic traditions the world over. She was the principal founder of the Theosophical Society in New York City in 1875, and devoted her extraordinary literary talents to its humanitarian and educational purposes until her death in London, England, on May 8, 1891. 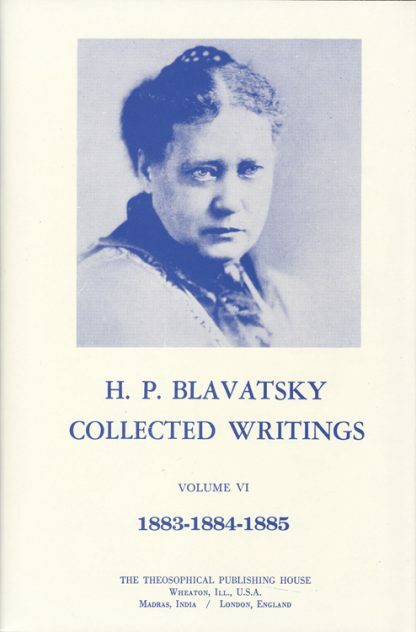 Along with writing her several books, H. P. Blavatsky kept up a voluminous correspondence and also contributed a steady stream of essays and articles to periodicals in English, French, and Russian.